Representing Central Whidbey Island Fire & Rescue, Chief Ed Hartin delivered presentations on Practical Fire Dynamics and on the hazard of ventilation controlled fires at FRI & FDIC in 2011. These presentations referenced several case studies developed by CFBT-US, LLC. This paper examines live fire training as a simulation of fires in the built environment and presents a potential methodology for exploring critical elements in fidelity (the extent to which the simulation reflects reality). This paper was presented in October 2009 at the Swedish Civil Contingencies Agency in Sandö, Sweden. This paper examines limitations in current standards and curriculum and points out the need for firefighters and fire officers to develop scientific literacy in order to understand and apply practical fire dynamics. This paper was presented at the 2009 International Firefighting Safety Conference in Sydney, Australia. Published in the November 2008 issue of FireRescue magazine this article provides an overview of 3D Firefighting concepts and the integreation of research and practical application to define best practices in firefighting. Published in the August 2008 issue of FireRescue magazine this article examines the most common extreme fire behavior phenomena, how firefighters can recognize conditions that may result in flashover, and strategies to control the fire environment to prevent flashover from occuring. Originally published on Firehouse.com, this article xplains the basic concept behind compartment fire behavior training (CFBT) as an integrated framework for developing structural firefighting knowledge and skills. This article is also available in Spanish: ¿Por qué es importante el entrenamiento en comportamiento del fuego (CFBT)? (Juan Kunstman, Trans.). This article was originally published on Firehouse.com. While the total number of firefighter fatalities has decreased, the rate of fatalities during interior structural firefighting operations due to traumatic cause has increased. This article points out how CFBT can improve firefighter safety and the importance of CFBT Instructor Qualifications. This article is also available in Spanish: ¿Qué es el entrenamiento sobre comportamiento del fuego en compartimentos? (Juan Kunstman, Trans.). This article was originally published on Firehouse.com. This article examines basic combustion concepts, heat transfer, and combustion process of solid fuels that forms a foundation for understanding compartment fire development. This article is also available in Spanish: Desarrollo del fuego en compartimentos parte 1 (Juan Kunstman, Trans.). Josh Davis interviewed CFBT-US Chief Instructor Ed Hartin for the June 2005 article Fire Rebels which examined CFBT and thermal imaging in an examination of technology in firefighhting. Read the Article! 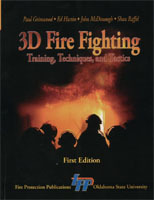 CFBT-US Chief Instructor Ed Hartin was interviewed about 3D Firefighting and CFBT on the 10 October 2007 edition of their television show focusing on firefighting technology. Watch the video!. CFBT-US Chief Instructor Ed Hartin was interviewed for the web presentation Firefighting with Fog: New Tecnhique Reduces Flammable Exhaust Risks to Firefighters. Watch the video!. Having a common language is critical to developing mutual understanding. Up till now there has been no single reference for terminology related to fire behavior and compartment fire behavior training (CFBT). CFBT-US, is developing a comprehensive glossary of terms in conjunction with the Institution of Fire Engineers (IFE) International Compartment Firefighting - Special Interest Group. This glossary is presented as a work in progress. Your feedback on this project would be greatly appreciated. Building skill in reading the fire takes practice. 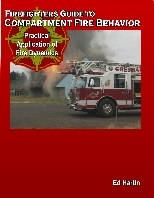 This worksheet is used for skill building activities in conjunction with photographs or video clips of structure fires. As a starting point, view the photo or video and identify Building, Smoke, Air Track, Heat, and Flame indicators, then answer the questions on the second page of the worksheet. After developing proficiency, view the photo or video and answer the questions, then go to the B-SAHF indicators and identify which were significant to you in answering the questions. Visit the CFBT-US Blog for examples of B-SAHF exercises! The indicators used in reading the fire can be presented in a variety of formats. However, reading the fire requires consideration of all relevent indicators in context. This concept map illustrates the current evolution of a graphic representation of the indicators and their interrelationships. Please let CFBT-US Chief Instructor Ed Hartin know if you have any feedback or suggestions. Small scale props are an extremely useful adjunct to CFBT as they provide the ability to demonstrate fire development and extreme fire behavior phenomenon even if live fire training facilities are not available. Plans are provided for single and multi-compartment dolls houses along with several other small scale props. These plans are also available with metric measurements.